M asonry is all about men in black suits getting together once a month and doing a bit for charity, right? Not necessarily. An offshoot of Freemasonry is the Lady Associate Members Society (LAMS), and its aim is to provide friendship and social activities for Masons’ wives, daughters and widows. Peterborough LAMS was formed in 2003, their first meeting was over a cup of tea and biscuits and since then they have grown to a membership of 62. Friends of LAM’s are always very welcome. Meetings take place on the first Monday of each month at 19.30 at Ellindon Masonic Centre, Peterborough. In addition, they have Coffee Mornings on the third Thursday of each month at 10.30 am and for those with lots of enthusiasm, there are exercise classes on Wednesdays! 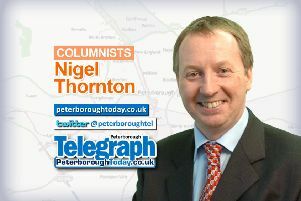 The organisation arranges social activities for members and raises funds supporting not only Peterborough Masons and the good work they accomplish, but also their own selected charitable causes as well. For example, this year, the Peterborough LAMS have made The Phoenix School for Children with Profound and Severe Multiple Learning Difficulties, Talking Newspapers and Heltwate School their chosen charities. Since 2003 they have donated over £27,000 to a range of charities. 2017 was a busy year for the LAMS, starting with a New Year’s party for Members and their friends. There have been a number of fascinating speakers with topics ranging from Diamonds & Pearls; Cakes for Royalty; the popular local historian, Stuart Orme, talked on the life of Richard III; Peterborough ‘Blue Plaques’ and High Security Prisons by Michael Flanagan (pictured) who, although speaking on a very interesting and serious subject, managed to inject a sense of humour into the evening. Outings for members, families and friends included a trip to the theatre to see Mamma Mia and a very successful day out to Stoke Bruerne for a canal trip with delicious food and great weather. There were also the summer coffee morning in June, and the Annual Summer Supper at Ellindon in July. Partners, friends and families were also invited to the Autumn Coffee Morning, and the year was brought to a close with the very popular Beetle Drive & Supper. And 2018’s diary is filling up - one noteable event being when the Peterborough LAMS welcome The Northampton & Rushden LAMS for lunch at Ellindon in May. Men in black suits? Think again. For more information on their activities see www.ellindonlams.org.uk . If you want to know more about Freemasonry in Peterborough, visit www.northants- huntsmasons.org.uk or call the Ellindon Masonic Centre on 01733 331948.